I don’t think my mother ever bought pâté when we were growing up. But I remember, every Christmas, for a number of years, we would get an earthenware pot of homemade pâté from a family friend. That was my introduction to pâté and I’ve loved it ever since. Mind you, I’ve always liked liver ( I remember, as a teenager, being one of the few who enjoyed the dinners of Liver and Onions that we would sometimes get at the boarding school. As the other girls pushed around the food on their plates and pretended to eat, I would happily have seconds!). 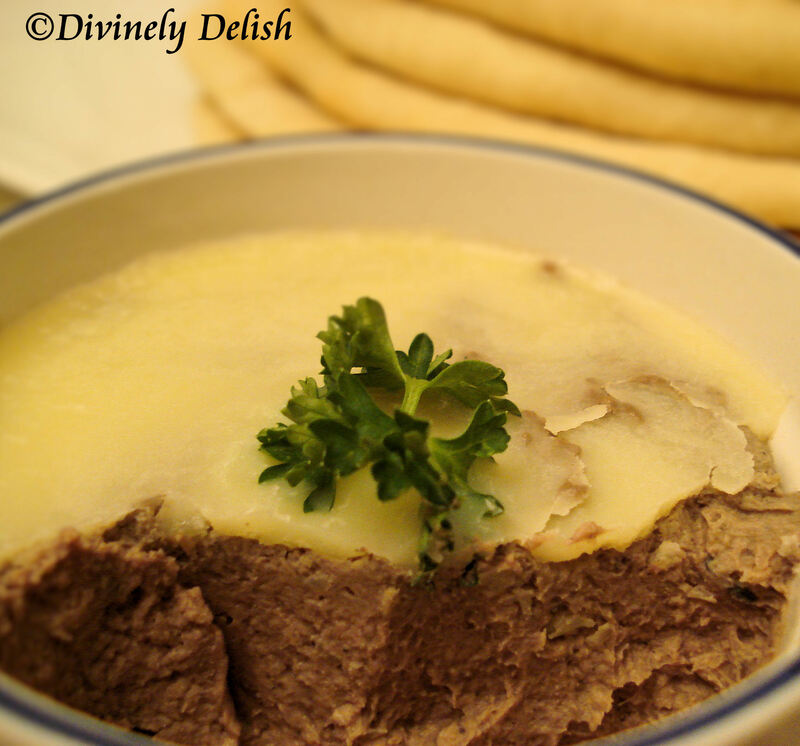 I’ve been wanting to try making pâté for a really long time. It’s probably been in the back of my mind for years. But I just never got around to it. Probably because it’s just not that easy to find liver being sold at the big supermarket chains here which I usually shop at. I’ve wondered about that, but then again, seeing that so many people seem to dislike liver, why would the stores sell it? On a rare occasion that I found liver, I finally decided to attempt making my own pâté. I never knew it could be so easy. Spread it on crusty bread and this is a must-have appetizer! 1) Melt 1 stick butter in a large nonstick skillet over moderately low heat, then cook onion and garlic, stirring, until softened, about 5 minutes. Add herbs, salt, pepper, allspice, and livers and cook, stirring, until livers are cooked outside but still pink when cut open, about 8 minutes. Stir in bourbon and remove from heat. Purée mixture in a food processor until smooth, then transfer pâté to crock and smooth top. 2) Melt remaining 1/2 stick butter in a very small heavy saucepan over low heat, then remove pan from heat and let butter stand 3 minutes. If using herb garnish, put sprig on top of pâté. Skim froth from butter, then spoon enough clarified butter over pâté to cover its surface, leaving milky solids in bottom of pan. 3) Chill pâté until butter is firm, about 30 minutes, then cover with plastic wrap and chill at least 2 hours more. Notes: Pâté can be chilled up to 2 weeks. Once butter seal has been broken, pâté keeps for 1 week, with its surface covered with plastic wrap and chilled. Though this pâté can be eaten the day it’s made, it’s even more flavorful after 1 or 2 days.